Today, there are more smart security cameras than ever, but they all have one major flaw: a very limited range of surveillance. You could wire your home with a dozen cameras and still have blindspots. Plus, your family might not like cameras constantly watching. At CES 2017, Alarm.com announced a cost-effective solution to blanket every inch of your home in non-intrusive, smart surveillance. The basis of the system is called the Insight Engine. This adaptive program can learn your family’s day-to-day patterns, like when your kids leave for school and come home, and only alert you when something is amiss. While programming an alarm system to only sound off when the backdoor opens at two in the morning is impressive enough, the Insight Engine adds icing on the cake with its automated drones. When a disturbance is detected, the drones could be deployed to investigate. Armed with high-resolution cameras, they would stream real-time video to you, no matter where you are. No experience with drones? No problem, as the drones would not require a human pilot. In fact, an Alarm.com representative told us that the company is not planning on adding direct controls. Combining automated drones and an adaptive security system gives you two major advantages. Because the drones can fly, any room with an open door is within their reach. The Insight Engine can leverage Alarm.com’s suite of sensors to help direct the drones to the area of the disturbance. From there, the drones can sweep the room, leaving no corner unchecked. The drones could also feed you more information. For example, a drip coming out of the ceiling might not be detected by a leak sensor, but a drone will definitely see it. At the end of the day, a smart home is only as smart as its owner. Our only concern regarding these drones has to do with their navigation. We only saw the drones in action via a video released by Alarm.com. If the navigation is up to snuff, the Insight Engine will catapult Alarm.com to the cutting edge of smart home security. 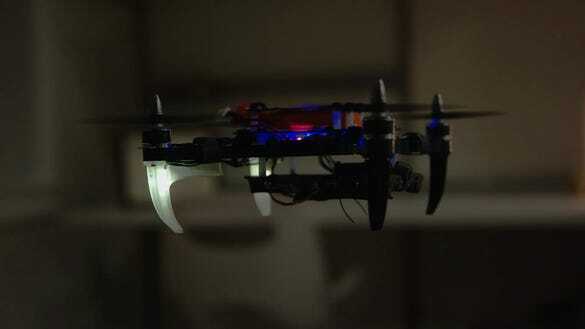 On the flip side, the alerts you get about bumps in the night might be these drones crashing into the walls. The company’s Insight Engine is available now, while the drone concept could become a reality in the near future.